In the beginning a little girl lived in a house on Egypt Street. One day her grandmother gave her a very fine rabbit, almost three feet tall, made mostly of china, with real rabbit fur for its ears. Those of you who’ve read Kate DiCamillo’s novel The Miraculous Journey of Edward Tulane know what comes next: As fine as Edward Tulane looked (for that was the toy rabbit’s name), he was not a very nice rabbit. He was, in fact, exceedingly vain and careless of other creatures’ feelings, although the little girl showered him with love. You might say that Edward was selfish and irritating. You might say he was callous, even cruel. You might also ask, why, then, should we care? And that’s where at least a part of the miracle comes in. Because, as things turn out, we do. We care very much. 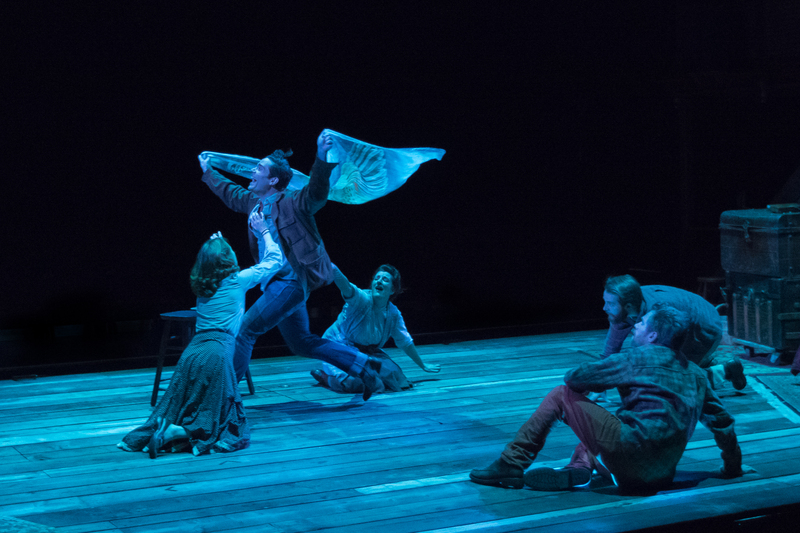 A remarkable emotional alchemy is taking place through April 24 inside Portland’s intimate Dolores Winningstad Theatre, which is hosting a swift and smart and breathless stage version of DiCamillo’s 2006 tale, adapted for a small and nimble cast by Dwayne Hartford. Oregon Children’s Theatre’s new production, under Marcella Crowson’s direction and performed on a spare and clever trap-door set designed by Polly Robbins, is very, very fine: a deft picaresque that somehow gives this story of a rather silly rabbit a good deal of humor and joy and suspense and yearning, and an altogether unexpected (for me, at any rate) emotional depth. Children and adults might prepare themselves to be moved by a story that approaches the archetypal as Edward is swept by whim and chance to the bottom of the sea (where he stays, face-down in the muck, for 297 days); to a fisherman’s boat; to the house where the fisherman’s wife is grieving; to the town dump; to a series of adventures with a hobo and a dog on the road; to the home of a little girl fading from tuberculosis; to the counter of a Memphis breakfast diner, where something brutal and life-altering and truly astonishing happens. And in the end … well, wait and see. 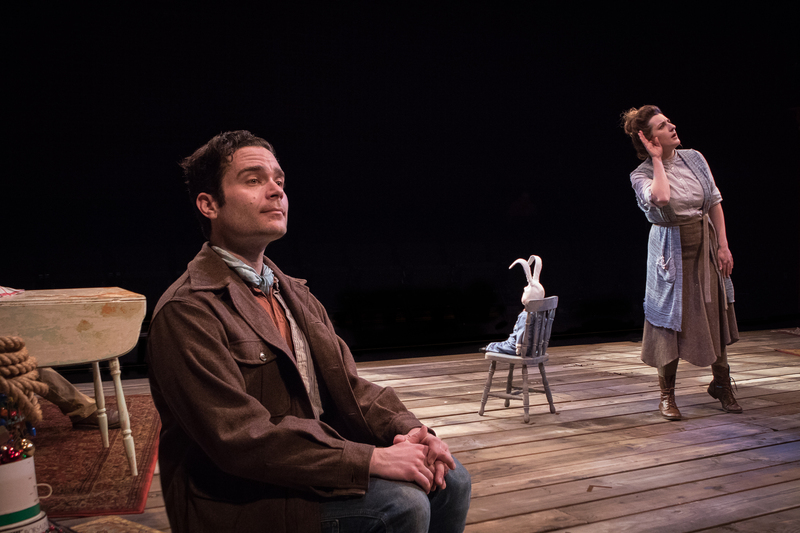 OCT’s Edward Tulane is a model of efficient stagecraft, combining a wide-angle tale of travel and adventure with intimate staging made even more intimate by being presented in a modified round, with the stage thrust forward and a bank of seats rising in the area that’s ordinarily upstage. A jumble of dolls and other toys belonging to the original little girl, Abilene, sits to the side of the stage like a memory, always there no matter where the action takes Edward on his quest for empathy. Characters casually pick up musical instruments – guitars, a banjo, a ukulele – to urge the action along (Rory Stitt is the composer and sound designer); the rich and tattered costumes by Jenny Ampersand, with assistance from apprentice Heidi Osaki, deftly evoke the travelers’ rising and falling fortunes. Don Crossley’s lighting plays an important role in sweeping the action across a mostly bare stage. The actors bring it all to life, setting an open and self-assured narrative style as they briskly leap from place to place and role to role. The strange out-of-body experience of Edward’s personality-split between the voice and actions of actor James Luster and the rabbit’s presence in the form of a series of large toy figures representing Edward’s varying fortunes (Robbins, the scenic designer, is also props master) works exceptionally well: the two become fused in the audience’s minds, and somehow more human than floppy doll. Emma Bridges is charming and never cloying as Abilene and a scatter of other characters; Emily June Newton moves deftly and sharply through several roles, including that of Abilene’s grandmother, who may or may not have mystic powers; Josh Edward and Conor Eifler nicely embody of host of other characters, from bratty boys to hobos to menacing railroad men and short-order cooks. This is a genuinely appealing ensemble piece of work, and for that much of the credit surely goes to director Crowson as well as to the cast itself. DiCamillo is also the author of several other novels for young readers, among them the popular Because of Winn-Dixie and The Tale of Despereaux, and in The Miraculous Journey of Edward Tulane she follows a picaresque path of life-as-journey that’s been taken countless times, from The Canturbury Tales to The Divine Comedy to Pericles, Prince of Tyre to Moll Flanders, Treasure Island, The Adventures of Huckleberry Finn, The Wind in the Willows, and beyond. These are journeys of discovery, not just in time and space, but of the soul. Gentle readers, young and old: along such roads, it’s all right to shed a tear. Like a lot of theater companies, Oregon Children’s Theatre has recently announced its 2016-17 season, and the lineup includes three world premieres, one of them based on DiCamillo’s Newberry Award-winning 2013 novel Flora & Ulysses. The other two are Goosbumps the Musical: Phantom of the Auditorium and Fly Guy: The Musical. They’ll be joined by the popular bilingual production Tomàs & the Library Lady, and, after five years, a revival of the company’s huge hit Pinkalicious. In addition, OCT’s Young Professional Company will present three shows for teen audiences: the fascinating fable In the Forest She Grew Fangs, which Defunkt Theatre successfully produced a while back; the improv show Impulse (for audiences as young as 7), and a revival of Orphans. The season runs from October through June 2017. To give credit where credit is due, though I did prop the show in addition to designing the set, the Edward rabbits were rented from Chicago Children’s Theatre. Thanks for clarifying that, Polly. Props to you for pointing it out!